Born near Trino Vercellese in North Italy in 1966. From a very early age he began to play with small jazz combos, with various Italian symphony orchestras (Orchestra Sinfonica della RAI, Torino, the Orchestra Internazionale d'Italia and the Filarmonici di Torino) as well as with several brass chamber music ensembles. With the latter he performed at festivals such as Settembre Musica, Asti Teatro 14/15 and Piemonte in Musica and won prizes at competitions in Stresa, Moncalieri, Asti and Busalla. In addition to his work with ensembles of classical music he has been a very active jazz musician, playing with some of the most important figures of the contemporary Italian creative jazz scene. 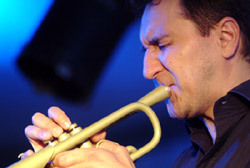 He is currently a member of the Enrico Fazio's Sextet, of Riccardo Brazzale's "Lidian Sound Orchestra", of Stefano Maltese's "Open Sound Ensemble"; of Sandro Cerino's "Crescendo Big Band"; of the Giancarlo Schiaffini's Quintet; of the Enten EllerQuartet, of the Giorgio Gaslini's "Proxima Centauri Orchestra", of the Italian Instabile Orchestra (which has performed at many of Europe's most important jazz festivals and recorded more CDs, including one for ECM and one for ENJA). He has also been a member of the Grande Orchestra Nazionale di Jazz conducted by Giorgio Gaslini, as well as of many other groups all over Italy, playng with important musicians such as Elton Dean, Tim Berne, Tony Scott, Maria Schneider, Charlie Mariano and Cecil Taylor. In 1994 he started the Trumpet buzz duo with Guido Mazzon and the Brasserie Trio with Carlo Actis Dato and Lauro Rossi. From 1995 to 2005 he was a member of Paolo Conte's Orchestra and played with him on his European tour. In 1997 he founded the "Phoebus Ensemble", a nine-piece band, primarily as a vehicle for his own compositions, though the group's repertoire ranges from Renaissance to contemporary jazz. From 1997 to 1999 he was director of the Hasta Big Band. He is currently director of the "CVM Jazz Orchestra". Since 1999 he has taught trumpet and Orchestrals Practical works at the Courmayeur International Music Meeting. He also teaches trumpet at the Istituto Comunale di Musica "G. Verdi" in Asti, and at the "Centro Vercelli Musica Enrico Lucchini" in Vercelli. In 2001 he has trumpet teachers at the "3º Seminario de Jazz y Flamenco" of Sevilla and at the "Corso di alto perfezionamento ad indirizzo jazzistico" of Lecco. Alwais from 2001, he founded his own quartet, the Alberto Mandarini Quartet with Umberto Petrin, Giovanni Maier and U. T. Gandhi. From the 2002 he is a member of the "Rara Jazz Quartet" with Roberto Bonati, Andrea Dulbecco and Roberto Dani. He has played on many city (single concert and festivals), such as,: Nevers; S. Anna Arresi; Buenos Aires; Clusone; Noci; Rive-de-Gier; Monaco; Mulhouse; Bolzano; Zurigo; Roma; Moers; Le Mans; Vilshofen; Caserta; Ragusa; Norimberga; Verona; Bombay; New Delhi; Roccella Jonica; Grenoble; Reggio Emilia; Ivrea; Amsterdam; Mantova; Torino; Lecce; Ulrichsberg; Cannes; Den Haag; Berlino; Parigi; Willisau; Ruvo di Puglia; Dortmund; Genova; New York; Ferrara; Bruxelles; Valence; Pisa; Vignola; Perpignan; Madrid; Faro; Münster; Graz; Orsara; Saalfelden; Siracusa; S.Francisco; Siviglia; Nantes; Chiasso; Cremona; Trento; Vicenza; Merano; Bath; Vancouver; Toronto; Montreal; Skopje; Guimarães; Yokohama; Fukui; Copenhagen; Darmstadt.